Through educational and practical experiences the Therapeutic Recreation program prepares graduates to be competent entry-level Therapeutic Recreation Specialists in the cognitive (knowledge), psychomotor (skills), and affective (behaviour) learning domains. Graduates of the program will be prepared to successfully meet the requirements to complete the National Council for Therapeutic Recreation Certification (NCTRC) exam and become a Certified Therapeutic Recreation Specialist (CTRS). IMPORTANT NOTE: The application deadline will be changing to March 15 for applicants applying for Fall 2020 admission. Therapeutic Recreation uses a systematic process (assess, plan, implement, evaluate, and documentation) towards making changes in a person’s emotional, spiritual, mental, social, and physical well-being in the environment that they reside. Therapeutic Recreation engages persons based upon their abilities in planned recreation and related experiences, promotes and educates persons in health and wellness, and reduces or eliminates activity limitations to achieve optimal health and well-being. 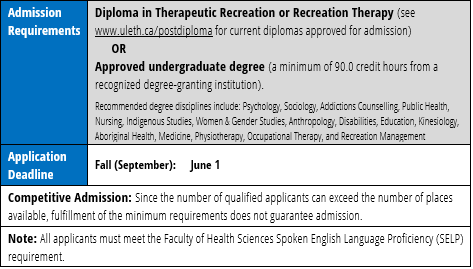 Graduates pursue careers as certified therapeutic recreation specialists in a variety of settings including long term care, acute care, day programs, rehabilitation, youth-at-risk, community centres, and mental health and addictions. • Bases practice on knowledge of history, service models, theory/philosophy, anatomy and physiology, growth/development, and psychology. • Demonstrate ethical and professional conduct as defined by Therapeutic Recreation professional, certification, and licensing bodies and human rights legislative acts. • Use current, relevant research to guide practice. • Assess and systematically collect comprehensive and accurate information to plan one-on-one and group programs/interventions. • Collaboratively plan and develop care plans that identify measurable and meaningful goals, modalities, techniques, and interventions specific to the needs of the person. • Implement program plans using current, relevant interventions to encourage meaningful participation, make changes in the person’s well-being, and engage in life activities. • Conduct evaluation and research to determine changes that occur based on programs implemented. • Deliver therapeutic recreation programs that respect diversity of the people that they serve. Graduates of the Bachelor of Therapeutic Recreation program may choose to pursue graduate studies in the Health Sciences major in the Master of Science program and the Population Studies in Health major in the Ph.D. program at the University of Lethbridge.